We have fully embraced the idea of spring and all that it encompasses in the Bear Cubs classroom. 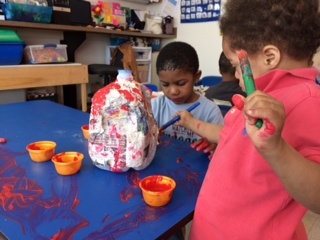 With our Occupational therapist we made a Paper Mache bird house out of a milk jug in the morning class and took our experimentation outside for the afternoon group. As we always say here at the Early Intervention Center, it is more about the process, not the product and being very flexible. 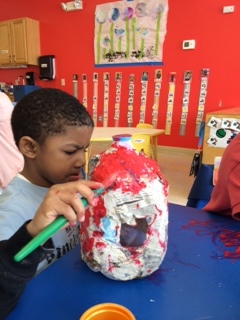 As we weremaking our bird house outside we quickly realized that we forgot our Paper Mache materials. To improvise we used grass, sticks, flowers, nuts, and dirt (things that we thought birds would like on their house). The afternoon kids loved collecting the items for the bird house and we made it a more of a nature centered lesson opening the conversation up to talk about what we saw on the ground and what we thought birds eat. In keeping with the spring tradition of gardening, we have planted carrots and flowers. Each child decorated their pot with stickers, and of course Thomas the Train made it on to most of the pots. Weplaced them next to the window to get the most amount of sunlight and have loved watching them grow and being a part of the process by watering them every day. We have been reading the book, Planting a Rainbow, which talks about planting and growing various flowers. This project really helped our children to better understand what it means to plant. 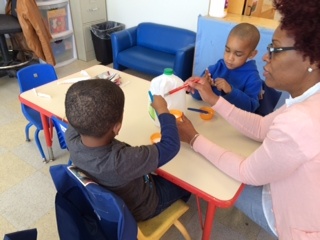 This entry was posted in Occupational Therapy and tagged bird house activities, Early Intervention, Easter Seals, Occupational Therapy, OT, spring activities on May 19, 2014 by Easterseals.